The Entertainments on offer in 2018. Note that we'll keep updating this, and there can be changes on the day! 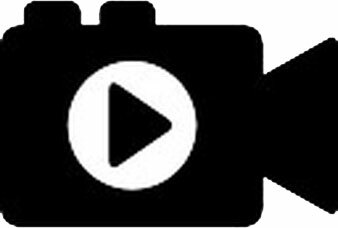 Acts on video from previous Fairs can be found at bottom of page here. Most of the musicians will be performing in the music tent, this year situated at the bottom of Castle Street. 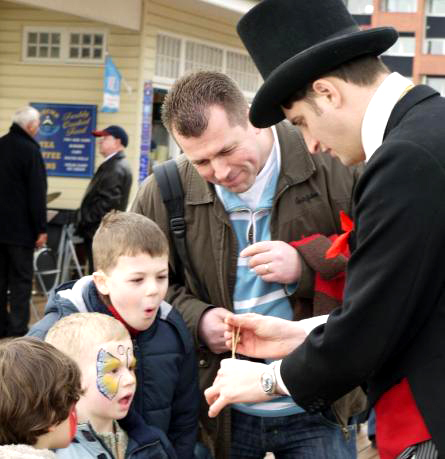 Other entertainments you will find around the Fair! We are delighted that some of the Exeter Authors Association will again be at this year’s Fair so that you can meet them and chat about their books. They will be in the Community Hall - more details here. Stripey Howling Hancock is a regular visitor to the Fair. He is based in Exeter and is an accomplished guitarist and blues player. He will be returning to Bampton by popular demand. As well as his own perfomances he will no doubt be teaming up with Chucklefoot for impromtu music! 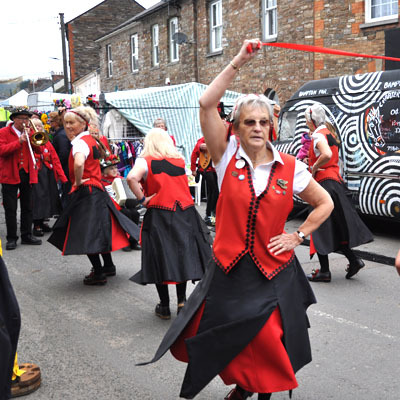 Jan’s Van will once again be operating in the town providing activities and fun things to do for the younger visitors. 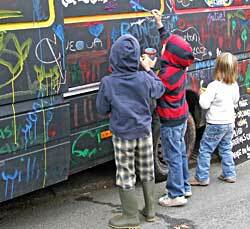 Face painting, balloon modeling, dragon dancing and drawing graffiti on her van are all very popular. A real Bampton Fair character. See the front of this year's Fair Programme! 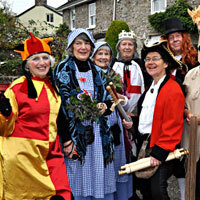 Well-established local thespians, they are back with the MUMMERS' PLAY this year. Catch them performing after the Procession at 10 am, at 11.45pm outside the Toucan, and at 1pm outside the Swan - times are approximate! 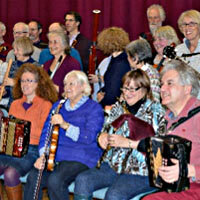 The Rough Music Folk Orchestra of East Devon was established in 2001. Their repertoire ranges from Devon step-dances, through Breton airs, to Swedish polkas, with much more in between. This is their first visit to the Fair. CHUCKLEFOOT One Man Band is an international entertainer who has worked all around the world, and has featured on TV and radio many times. It is great when he teams up with other musicians and a jam session ensues. 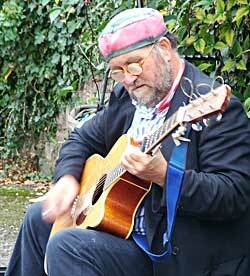 He is very popular on YouTube, playing at Bampton Charter Fair. They are new to the Fair this year and they feature our very own Rev Kev on guitar! 1950’s Skiffle that sounds like Snooks Eaglin, Bo Diddley The Musician, Leadbelly, Jed Davenport and his Beale Street Jug band (they say!). Cool. 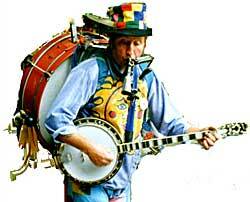 Also playing at evening gig with the Wurzels. 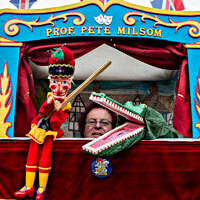 The Original Punch & Judy Show, taught by the late Prof Guy Higgins, who performed on Weymouth beach for 30 years. Now in the seventh year of performing, this year we have performed shows as far north as Manchester and south into Cornwall. We have been to Covent Garden, Sturminster Newton Cheese Festival and the National Arboretum at Westonbirt as well as many others. More here. 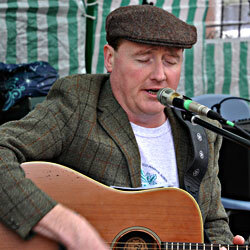 Ian Idris is a Dulverton traditional singer / songwriter with a wide and varied repertoire of past and present day songs as illustrated on his ‘ The Rose of England’ CD. His Influences, Cyril Tawney, Steeleye Span and the Watersons fire his passion for traditional songs and customs. He has a powerful wide ranging voice that will leave a memorable impression on all who hear him. Stampita describe themselves as Uncommon Folk making uncommonly good music – four musicians performing original and traditional songs and tunes on a wide variety of instruments. They are based in Taunton, and this is their second time at our Fair. 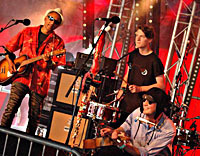 They perform a unique blend of original, traditional and contemporary material with a line up which includes bouzouki, mandolin, bass guitar, flute, rock steady percussion, a blend of vocals and a dash of keyboards. This wonderful group of street dancers and their band came to the Fair two years ago and we are delighted to see them back. Their speciality is clog Morris dancing. Their name derives from 1797 when a group of Ilfracombe ladies clad in red petticoats saw off the French invaders! SORRY- This dance group has had to cancel because of illness. Brett Damarell is a professional musician of 25 years from Truro and has been described as the 'Folk voice of Cornwall'. 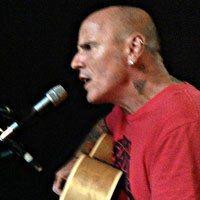 Also known as Ramblin' Minor, Brett plays a gritty blend of acoustic folk and blues with a touch of Celtic flair. His mate Andy is the other half of the duo. They proved very popular with the crowd at last year's Fair.